I often get asked a lot of questions about the whole recipe developing and blogging process. No, just like everyone else in the world, I am not perfect and every recipe does not turn out. There are sunken cakes and burnt bagels. There have been pies that just haven’t set and mushy veggies. There have been things that well, just.didn’t.turn.out. Well, I strive to share quality, tested recipes, so normally I make them at least several times before they reach the blog. Usually I first test during ‘normal’ conditions, not thinking about blogging, photography, etc. Then after I see how that turns out, then I make it again and possibly then again to photograph it. But then there are recipes that I have made for years and years, that have made it in regular rotation and for whatever reason, just never make it to the blog. These biscuits are one of those recipes. We absolutely love these biscuits! They are so good and the perfect accompaniment to so many dinners. From soup, stew, and chili; to pasta dishes and say a big turkey dinner. 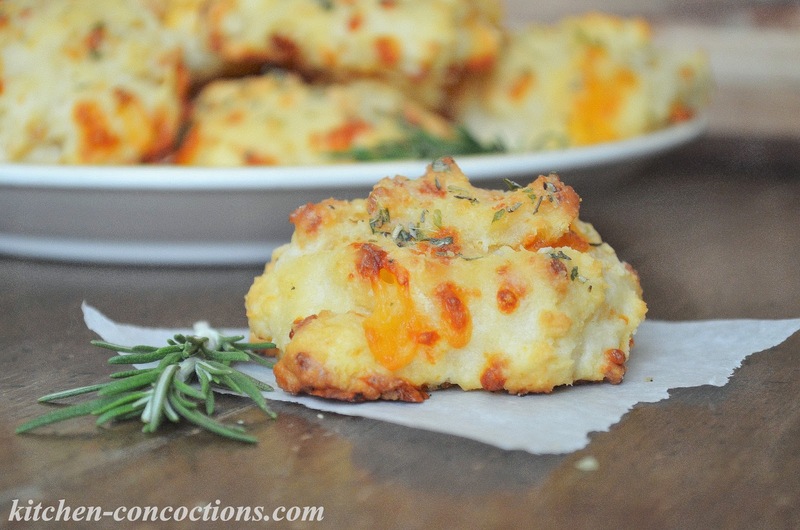 And not only are these biscuits so flavorful they are so easy. These biscuits are considered ‘drop’ biscuits, because you don’t have to roll them out and cut them, you simply use a spoon and scoop the dough and plop, or drop, it onto the baking sheet. If you have been intimidated by baking bread before, start with these biscuits because they are seriously fail proof and will make you a star in the eyes of your family. Preheat oven to 425 degrees. Grease a baking sheet with butter or line with a splat mat or parchment paper. In a medium bowl, combine flour, baking powder, garlic powder and salt. Using a pastry cutter, fork or your fingers and cut in butter until coarse, sand-like crumbs are formed. Lightly mix in grated cheese. Slowly mix in buttermilk, just until moist- do not over mix. 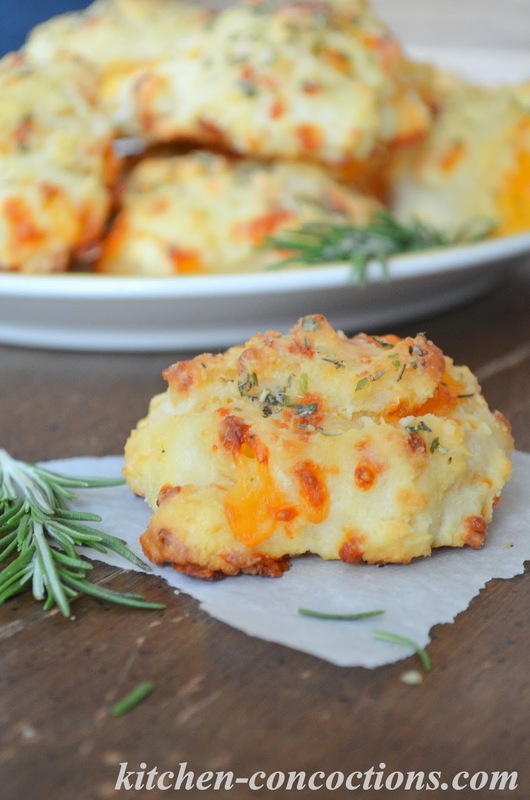 Drop the biscuits onto prepared baking sheet. Bake for 11-13 minutes, until browned and golden. 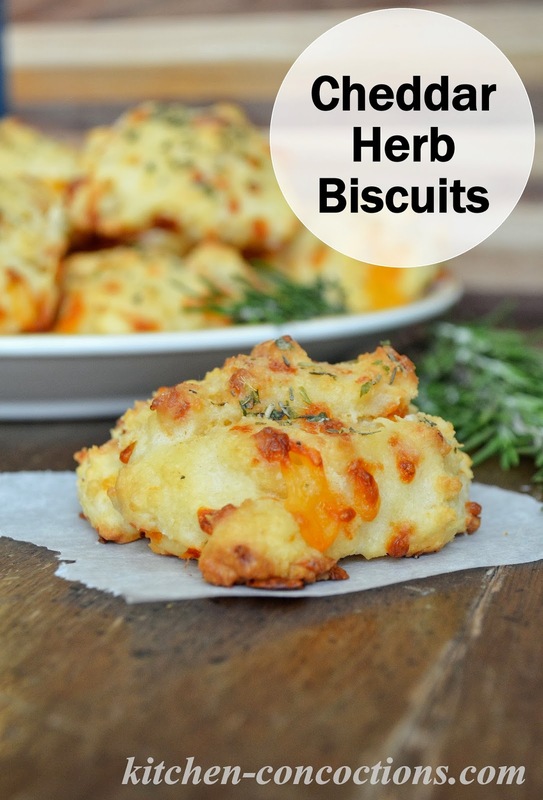 While the biscuits are baking, in a small bowl combine 3 tablespoons melted butter, dried herbs, and 1/2 teaspoon garlic powder. When the biscuits come out of the oven, evenly brush the butter/herb mixture over the biscuits. Serve immediately.